The InterDesign Kitchen Binz Lazy Susan Cabinet Storage Wedge is made to help you get your revolving pantry space organized. It features an integrated handle to make rearranging and portability a snap. 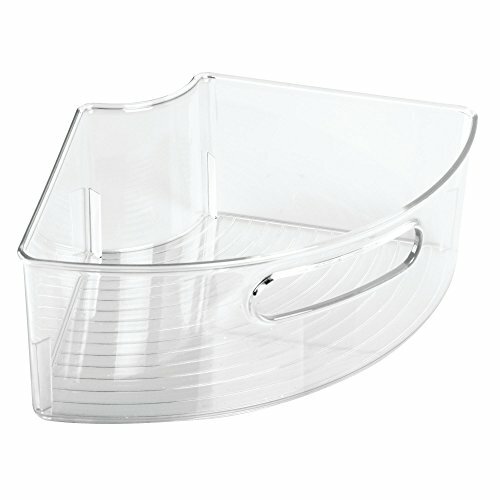 Clear surfaces allow you to easily view its contents while its deep capacity can hold larger items on turntable cabinet areas like condiments, packaged foods, spice jars and more. This 4-piece set makes a complete circle for your corner cabinet's turntable. LAZY SUSAN STORAGE: Pack of 4 storage containers help add organization to cabinets with turntable storage spaces; Clear surfaces let you see what you have instantly! DIMENSIONS: Works with 18" - 20" diameter Lazy Susans; Each wedge measures 12.56" x 7.33" x 4.05"